A Faygo pop bar set up for a “Faygo Book” talk at the Historical Socity of Michigan’s Local History conference on March 22. Photo by Kendall Wingrove. You got me. I went a little over the top today with my popup for the Historical Society of Michigan’s Local History Conference. 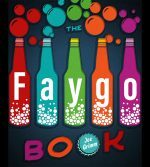 Blame my excitement over being invited to speak about “The Faygo Book.” The Local History Conference generally attracts speakers or panels in the meting rooms and vendors and merchandise int the open areas. A tabletop Faygo popup brings the color of vendor samples into the lectures. It started simply enough with a few bottles here and a 12-pack there. Start with a tablecloth and then napkins in Faygo colors. These are rainbow napkins, which saved me from sorting solid, colorful the napkins to make rainbows. The base is a pyramid of 12-packs in the back to give the popup some height. I used three here, but you could us more or make the ends the high points. Top the pyramid with bottles. I used a 2 1/2-liter that you can sometimes find at dollar stores for $1. It’s the biggest Faygo bottle I know of these days. If you have signs, they are your background. These signs came to me from Mike Skinner, who rescued them from restoration efforts at the old Ford Motor plant on Piquette. Use 2-liter bottles in as many flavors as you can find for a back row. Mix up the colors and include diet for those who prefer it. Faygo has great diet redpop, rock ‘n’ rye, grape, orange and root beer. In front of this backdrop, mix up 24-once and 20-once bottles with 12-ounce cans. Put the smallest ons in front, and mix the colors. Some six-packs of glass-bottle Faygos brings in some horizontal massing and big Faygo logos. Have a bottle opener on hand. Put out rainbow napkins. I added green slips with suggested Faygo flights, but would have liked red more. Make the effort to get cups in Faygo colors. These paper cups came from Party City and can be recycled. Sprinkle brightly colored drinking straws over everything. I wanted paper straws, but settled for plastic. Put ice off to the side. I put one cooler of ice cubes on top of another cooler to bring it up to table level without crowding it onto the table. Have a bag or box available for recycling or returning the empties. Invite your guests to help themselves to a Faygo. They will not need instructions of a second invitation. Next Post Where can I buy Faygo?